The intellectual property is secure. The science is sound. You’re about to make your pitch for funding. The scary next step for a biotech entrepreneur? Picking a company name. “It is a very emotionally charged exercise,” said Scott Piergrossi, vice president of creative at the Brand Institute, a Miami-based firm that specializes in pharmaceutical branding. For Kevin Pojasek and his cofounders, the business model was to develop medicine for chronic pain by targeting a molecule called tetrahydrobiopterin, or BH4. Other drug makers had riffed on the “tetra” prefix before. So, Pojasek played around with “four,” and came up with Quartet. Pojasek said he liked the fact that “there aren’t that many Q-starting biotechs.” But he wanted buy-in from his colleagues at Atlas Venture. He walked the hallways of the Cambridge venture capital firm, polling the partners with his six leading contenders for a name. In the end, Quartet easily beat out the other choices — Sirrona, K2, Ceptor, Ageron, and Quardrona — and Quartet Medicine was born in late 2013. But most startup founders simply brainstorm options for a while and then use their gut instincts to pick a winner. It wasn’t always so. Back in the 19th century, during the dawn of the modern pharmaceutical industry, most companies were eponymously named after their founders: think Pfizer, Bayer, Eli Lilly. The emergence of biotechnology in the 1970s brought with it names that incorporated “Bio” or “Gen” — or, in the case of Cambridge-based Biogen, both. Nowadays, drug company names are chosen to evoke a therapeutic focus, or to reflect “aspirational cues” like passion or innovation, Piergrossi said. Case in point: Alnylam Pharmaceuticals, named after a star in Orion’s belt. “It marks the strength of our vision, and gives our effort a clear association with something that’s up in the sky,” said Chief Executive John Maraganore. However, the Cambridge company did what many in the industry do: they tweaked the spelling, from Alnilam (the star) to Alnylam, to help it stand out to investors, in Google searches, and in trademark filings. The word Alnylam derives from Arabic — it means “string of pearls” — and in this, too, the company’s name is illustrative of a larger industry trend: Names drawn from words in Latin, Greek, or other foreign languages. Ancient mythology has provided yet another hotbed of name ideas — although that approach didn’t work out so well for ISIS Pharmaceuticals. Founded in 1989 with a name designed to conjure up visions of an Egyptian goddess, the California company recently rebranded as Ionis Pharmaceuticals to differentiate itself from the Islamic State. But when he set out to start a new company in 2012, Mahanthappa wanted something that more closely matched the company’s mission. 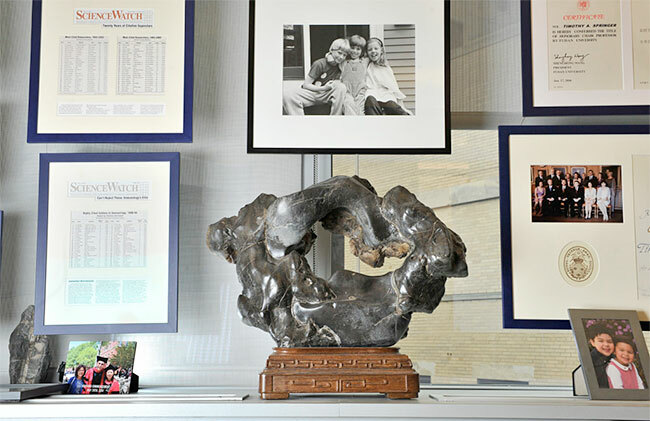 This sculpture inspired the name of Scholar Rock, a Cambridge-based drug company. Credit: Osh Reynolds for STAT. 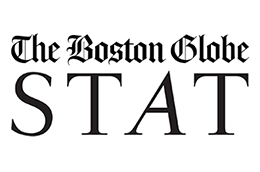 He was spitballing ideas with colleagues in the office of Tim Springer, a company cofounder from Boston Children’s Hospital, when Mahanthappa noticed an unusual sculpture on the windowsill. It was a Chinese scholar rock, a highly prized type of stone naturally shaped by erosion and wear, and its bumpy, donut form reminded Mahanthappa of the growth factor the company aimed to modulate to treat fibrosis and other diseases. The cofounders quickly turned to the computer to make sure the Internet domain name wasn’t taken. “These days you check the URL availability first, and then you check the trademark database,” Mahanthappa said. Scholar Rock’s name is an abstract example of a title that reflects the biology of the company, but many firms are far less opaque. Last month, for example, a Stanford spinoff came out of stealth mode with $75 million in initial funding and a plan to treat cancer by blocking a surface molecule called CD47. The company’s name: Forty Seven Inc.
For his part, Forty Seven’s Chief Executive Jonathan MacQuitty acknowledged the risk in the name, and he conceded that it might have to be changed in the future. But “we believe that CD47 is going to be an unbelievably good target,” he said.